Time to polish like a BOSS!! Next onto polishing with the Griots Finishing Sealant. My guess is any other class taking place across America or the world... everyone is still sitting in a chair listening to someone talk. The above was this morning. Since then, the guys have all been hand sanding then machine sanding. They have NOT been watching me hand sand or me machine sand - THEY have been hand sanding and machine sanding. Next up THEY get to use rotary buffers to remove sanding marks and then we go into Steam Machines and Hot Water Extractors. Awesome! So cool. Been there done that & would be back to do it all again in a heart beat. 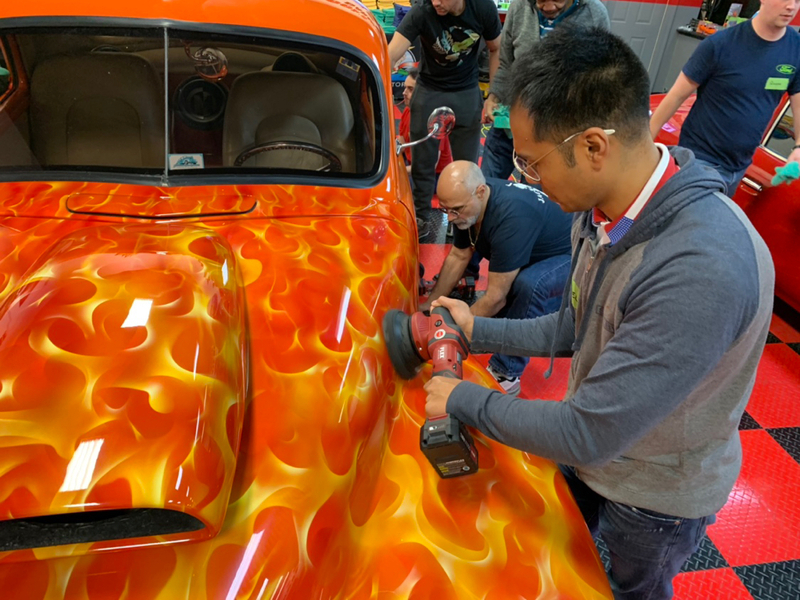 So much to learn, & geeze - if you’re kinda new to detailing & thinking of buying a polisher - no better place to get a real feel for pretty much every tool on the market. Every time! You find stunning cars to work on Mike & not only is it cool to work on these cars it makes it memorable too. I can still vividly see the dash on that beautiful ‘63 Chrysler 300 Sports Coupe we worked on, the swirled up black paint on that ‘63 Pontiac Bonneville . . . I could go on. Great coverage Mike, thank you for sharing! I bet everyone is learning heaps & lots. Enjoy! Thanks Aaryn for chiming in! Thank you to everyone that attended - I appreciate your trust! Hands-on every day all day. Try to find more pictures and more videos showing what takes place on any other class. Try. Video on my Facebook page showing the coating being applied and hers the incredibly GLASSY looking results!!!! Great students at this class not only doing phenomenal work but having a ton of fun too! Chances are none of us will ever have the opportunity again to detail a 1941 Chrysler Business Man’s Coupe. There’s videos of the class doing all the correction work to the Ferrari on my Facebook page. Same time every year for the last 10 years!!!! Have fun! Learn a LOT!!! !